Most electric shavers are made for men and most complaint that electric shavers or electric razors are not suitable for their skin due to reasons like itchy and sore skin and also irritation caused by the shavers. Most men will then just stop using electric shavers and give up thinking that they have a tough beard and also sensitive skin but actually, they have to be patient and the face will get used to the shavers after a week or two. 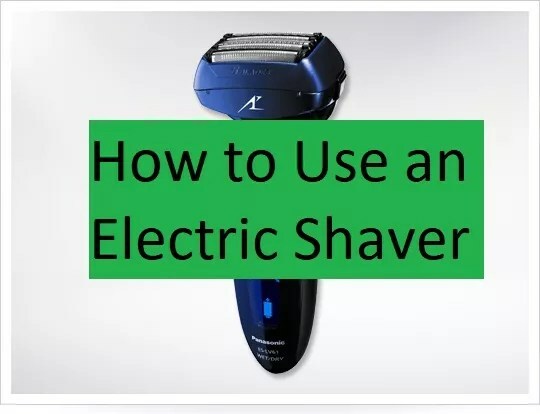 In order to avoid unpleasant experiences above, there are 16 tips on how to use electric shavers correctly that I manage to find from the internet and have them summarized below. 1. Don’t shave after a shower or after you wash your face. Shave when your face is dry for a closer shave but this can be painful sometimes. 2. Shave up “against the grain” and horizontally across the face. 3. To cut easily, stretch the hairs upright with your fingers. 4. Apply light pressure and let the electric shaver do the work to get a closer shave and less irritation. 5. Start shaving in a more sensitive area such as the neck because some electric shavers will generate heat after few minutes of shaving. 6. Make sure that you follow the cleaning and maintenance instructions and change the foils and cutters as needed. 7. Read the instruction manual for the closest shave tips. 8. Get an electric shaver that comes with an auto cleaning function and also washable. 9. Get the correct shavers. Rotary type works better on light beards while Foil type is an old fashion way of shaving. 10. In contrast to the first tip above, you can wash your face with a shaving wash or face scrub and dry the face. Then apply pre-electric shaving lotion or gel and let it sink into the skin to make the skin dry. 11. Apply aftershave or some type of balm and do not use cologne or Eau de toilet because they will only add more pain. 12. Shave daily if time permits because electric shavers are more effective cutting short facial hair and it is less painful. 13. Buy an electric shaver with built-in gel dispenser to minimize skin irritation if you always get razor burn. 14. If you have sensitive skin, apply some baby powder to your face to reduce friction while shaving. 15. Keep the electric shaver away from stray hairs to avoid the hairs being pulled and clogging up the shaver. 16. If the shaver is powered up by batteries, keep some spare batteries. Hopefully, the tips above could give you to find answers on how to use electric shavers properly. More tips are welcome in the comment section. Thanks.